who doesn’t use a spear as a bookmark? a unique survival from the age of William the Conqueror. On loan to Museum of Somerset from Exeter Cathedral. Okay, that might just be the one thing I haven’t used as a bookmark. Point me to the last paragraph I read, please and thank you. Good find as always, Beth. Oh to think of the hands that held the book, MADE the book, lay the spear down, MADE the spear, and how long it must have been there…..
Wow. How interesting, thank you, Beth. very cool – makes my mind wonder about the time and place and circumstances when it happened. I’ve used some odd things as bookmarks. You know, whatever lies within reach. But never a spear. Or a knife, maybe? As a history buff I am always interested in curious things like this. I can imagine someone holding it through different time periods and marking their pkace. Fascinating! What a great photo! Almost a thousand years old and still more stories than are written in its pages. Is that blood? 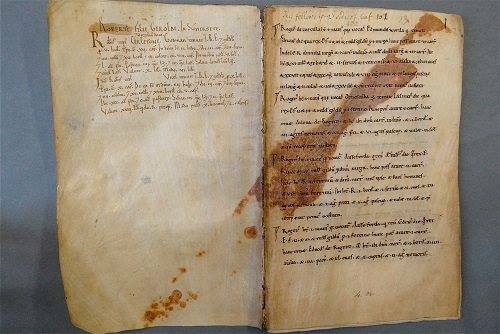 What a thing to do, to put a bloody spear on a book, hand-written and incredibly valuable at the time. Must have been there a long time then. Perhaps it was in some kind of display of wealth in someone’s home.